Early in "Hillbilly," Ashley York and Sally Rubin's documentary about stereotypes of rural whites from the Appalachian region of the U.S., we learn that Kentucky's two biggest employers are the coal industry and Wal-Mart. Then we meet a Wal-Mart employee named Billy Redden, a bespectacled fifty-something man who is first glimpsed pushing shopping carts through a store parking lot. (He's the fellow in the photo at the top of this review). 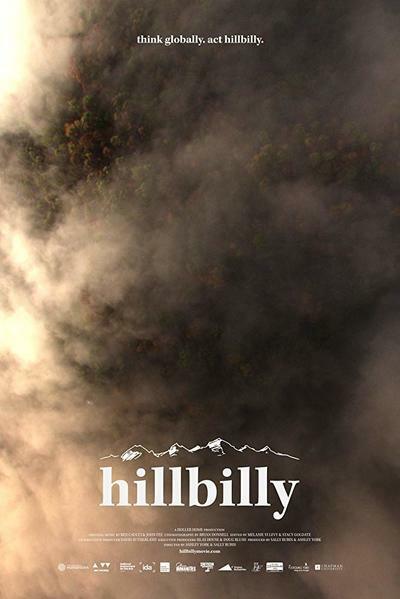 "Hillbilly" is a movie about how cultural stereotypes shape political and economic policy, and deform the self-image of the people being stereotyped. But unless you're a movie trivia buff, you might assume Redden is just one of many people profiled in the film. Then we get to the section about "Deliverance," a 1972 thriller about Atlanta businessmen who go on a camping trip in a part of rural Georgia that's about to be submerged by the construction of a new dam, and we learn that Redden played the blank-faced, faintly sinister teenager who challenges Ronny Cox's city slicker to a banjo duel. The scene marks the point when the film turns into a horror movie about country folk exacting violent revenge on city folk who've come to gawk at people whose lifestyle their economic ambitions are about to destroy. Redden earned $500 for his performance, plus a lifetime of being the poster child for the stereotype of the menacing redneck. The delayed revelation that Billy is the banjo kid from "Deliverance," and that he's now a middle-aged man working at Wal-Mart, a major Appalachian employer that has been persistently accused of exploiting its workforce, is a storytelling masterstroke. It connects a lot of the rhetorical strands that York and Rubin have been unspooling throughout the film's running time. "Hillbilly" is a jumbled work that probably tries to say too much—it's one of those intelligent, affable, heartfelt nonfiction movies that you might wish were either shorter or longer. It tries, not always successfully, to be three different kinds of documentary at once: a historical/pop culture primer, about how cultural stereotypes give governments and businesses permission to scapegoat and exploit certain classes of people; an election documentary about the mentality of the rural and/or poor Donald Trump supporter (it was filmed in 2016); and a semi-autobiography focusing on York, a onetime resident of Meathouse, Kentucky who is now a successful filmmaker living in Los Angeles. York is a fish-out-of-water wherever she goes. She always felt condescended to by city folks because of her accent, but doesn't fit into Appalachia anymore because she's a liberal feminist who voted for Hillary Clinton. Both the "filmmaker returns home" strand and the Election 2016 strand feel like attempts to superimpose a structure on a complicated subject that stubbornly resists a definitive reading. The strongest, most clearly articulated section is the middle, in which York and Rubin theorize that the stereotype of the shiftless, lazy, mean, substance-addicted hillbilly has been embraced by forces who benefited from it economically and politically. The list of exploiters includes the producers of films and TV shows like "Deliverance," "The Beverly Hillbillies," "The Simpsons" (home of Cletus the Slack-Jawed Yokel), and MTV's "Buckwild"; the architects of Lyndon Johnson's War on Poverty, who were afraid that Americans would reject government-sponsored social programs if the faces of poverty were Black, and unthinkingly encouraged a lot of drive-by reporting that made the region look like a Li'l Abner cartoon come to life; and the coal mining companies that ravaged the landscape for decades, worsening floods and pollution, then pulled out of the region, leaving joblessness in their wake. These assertions are strengthened by thoughtful, at times mournful observations by Appalachian intellectuals, including cultural critic bell hooks; Jerry Williamson, author of "Hillbillyland: What the Mountains Did to the Movies and what the Movies did to the Mountains"; Barbara Ellen Smith, a professor of women's and gender studies at Virginia Tech and author of many books about the region; and novelist, environmentalist and radio host Silas House. Smith calls cultural stereotyping "a way of legitimating the dispossession of the mountains." The imagery, she says, sends the message that, "It's only a region of trash, so why not trash it?" The economic devastation wrought by coal mining companies is cited as the main reason Appalachians voted for Trump, even if they had misgivings about his sexism, racism, ignorance, and belligerence. In the sections where York interviews fellow Appalachians, including her own relatives, we see how desperate Appalachians were for a champion, even a morally and ethically questionable one who boasted that he'd bring coal mining back to the region but never had a plan. ("The man knows how to make money," York's uncle Bobby insists, though Trump's wealth was inherited, and to this day, no one but the Trumps know how much of it he has.) Poor Appalachians' economic hunger fused with resentment against perceived "elite" enemies like Clinton, who was no more or less of a "regular person" than the New York City millionaire, but made the tactical mistake of saying half of all Trump voters could be placed in "the basket of deplorables," and showed little empathy for the Appalachian poor during the campaign. The stereotype does overlap with reality at times, however. To its credit, "Hillbilly" gets into the complicated dynamic of feeling pride in a culture and a region that has undeniable problems, not all of which were superimposed from outside. It's here, however, that the movie becomes self-contradictory, variously making it seem as if Trump's victory was karmic payback against left-leaning city people and pop culture producers for decades of caricatures, then circling around into self-loathing horror on Election Night and afterward, when it dawns on the film's many progressive Appalachians that there is a dark anger in the region that's not entirely righteous, and that Trump tapped into it brilliantly. "When you look at that electoral map," says Silas House, furious at the neighbors he's spent his adult life defending, "rural people did this." Then he adds, "Not alone. Certainly not alone." To be fair, if the movie never quite figures out what it thinks about this aspect of Appalachian identity, it may be because the filmmakers, like their subjects, are personally too close to it, and it's inherently messy and self-canceling anyway, as anyone who's alternately embraced and rejected their own stereotype will tell you. This is an ambitious and enlightening documentary, filled with wisdom and asking great questions, some of which may never have a satisfying answer.